First Line: When Thomas Wolfe said you can't go home again, Cat Latimer wondered if he knew he was full of crap. When former English professor Cat Latimer inherited a big Victorian house, she knew exactly what she wanted to do: host writers' retreats while she writes her own novels. The place is open for its first retreat, and bestselling author Tom Cook is one of the guests. Cat is thrilled to have him there even if she is wondering why on earth he came all the way from New York. He's going to be the perfect addition to her quirkier (and far less famous) attendees. When there's an unexpected ending for Tom Cook in his cozy guest room, Cat has all the help she needs. Her high school sweetheart Seth is on the premises renovating the rooms and her uncle is the local police chief. She may have a lot of help on hand, but one thing is certain: she's got to find Tom Cook's killer before her brand-new business becomes the next victim. Lynn Cahoon has written a very good mystery with an appealing main character. The setting is a winner, too, and I loved the house Cat inherited as well as learning how she and her business partner/friend Shauna had set up the retreat. This isn't the first cozy with a retreat-type setting that I've read, so I found it interesting that Cat hadn't thought to run background checks on her attendees either. That should probably be the very first tip in "Craft & Writers' Retreats for Dummies." (Don't google it; I made that title up.) I also wondered about having Seth do all that remodeling work on the house while the retreat was being held. There were supplies and tools out in the yard, a lot of hammering going on, and traffic with the aforementioned Seth and supplies on the same stairs the guests were using. As clumsy (and oblivious) as I know people can be, I would think Cat would finish the remodeling before she ran her first retreat to avoid possible injuries and law suits. I know, I know... she didn't have enough money to do it that way-- and Seth needed to be around a lot of the time. With the exception of Shauna, Seth, and Cat's uncle, the secondary cast doesn't stand out much, and since I'm the type of mystery reader who doesn't like much romance in her whodunits, there was way too much tingling going on between Cat and Seth. Enough that I really don't care to read further in the series. But that's just me-- the love-is-in-the-air element may tickle you pink, and I hope it does. 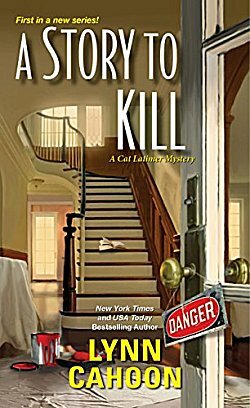 A Story to Kill ends on a bit of a cliffhanger concerning Cat's ex-husband, and it should draw you right into the next book in the series, Fatality by Firelight. Cat Latimer is a stellar main character and so is the writers' retreat setting. If romance is your thing, add that to what you will hopefully find to be a very enjoyable mystery. I have to admit, Cathy, I like the premise and setup of this one. I agree completely about the romance thing; it doesn't do a lot for me, either, most of the time. Still, an interesting premise! Very interesting. Almost makes me want to back out of my decision to read no further.